Here in Boston we got exactly no snow this winter. Heck, it hasn’t even been that cold! This is extremely rare, if you didn’t know. However, for the last two days it was snowing a blizzard out. Wacky! 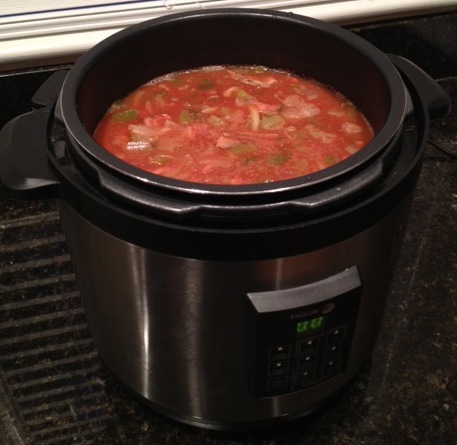 I took this opportunity to bust out the slow cooker and make us a wintery comfort food dish. I pretty much winged it on the recipe but it turned out really good. Warm, comforting, satisfying, and hearty. That’s the best kind of snowy weather food I can think of. Before you begin on this dish you’ll want to have pre-slow cooked your pork. Basically you take a 3-4 lb. pork shoulder, place in your slow cooker, fill halfway with water, add a teaspoon of salt and pepper, and let it cook down for 5-8 hours. That will yield a whole bunch of yummy, moist pork. You can pull it and eat it on a sandwich or just read on. Ok then. Take 2 lbs. 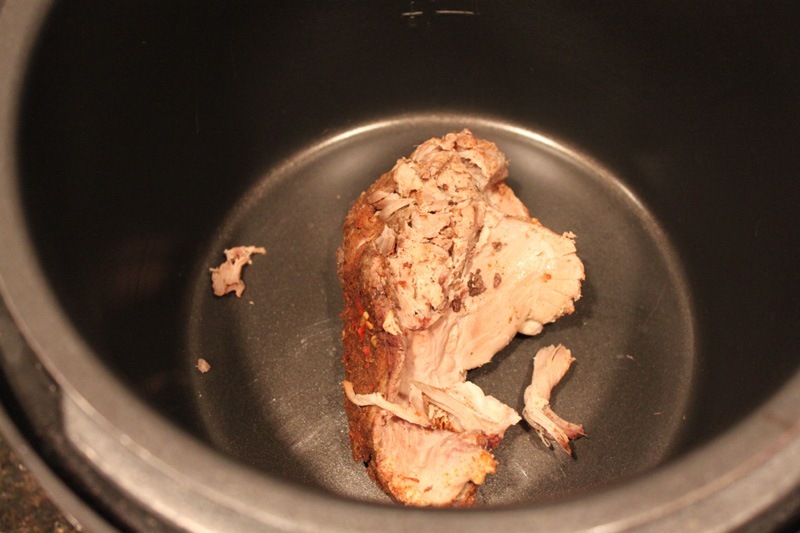 of the pork and put it in the bottom of the slow cooker. 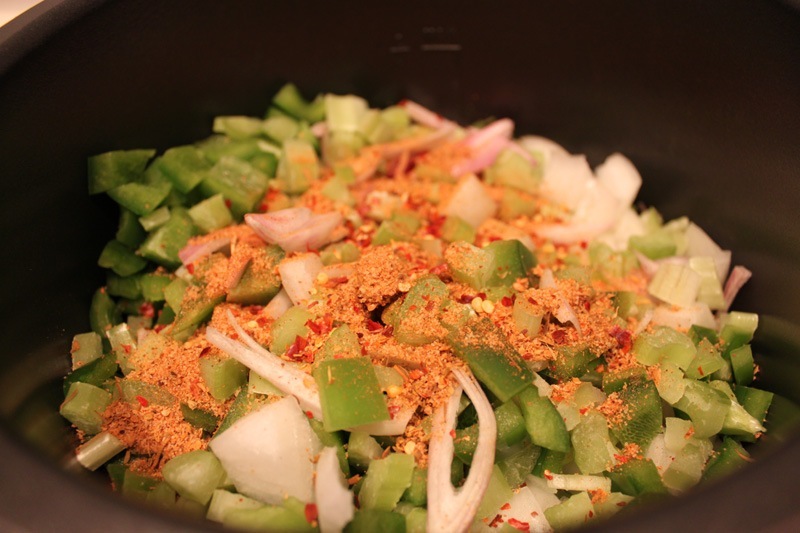 Then, in layers, add the red beans and chopped veggies. 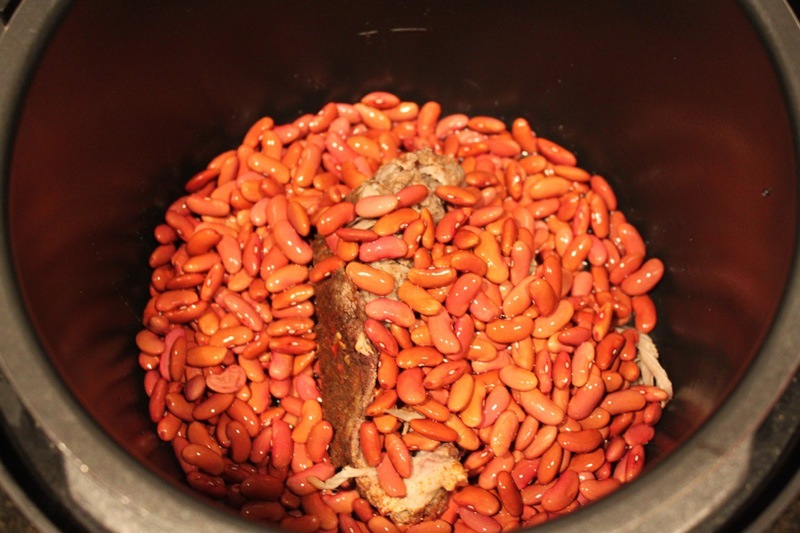 The beans go in dry and come out perfect. Super easy. 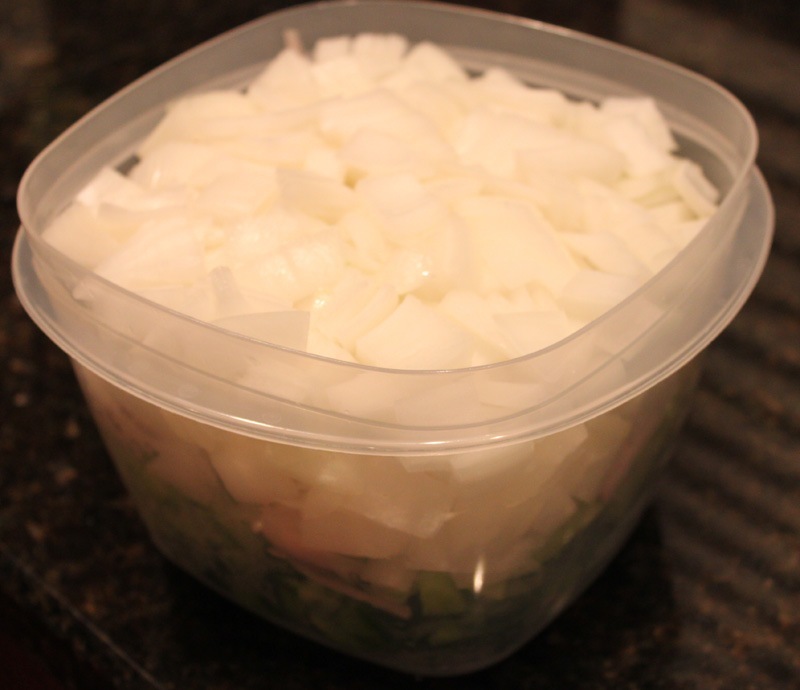 You can chop up the veggies ahead of time and store in the fridge until you are ready to use them like I did. 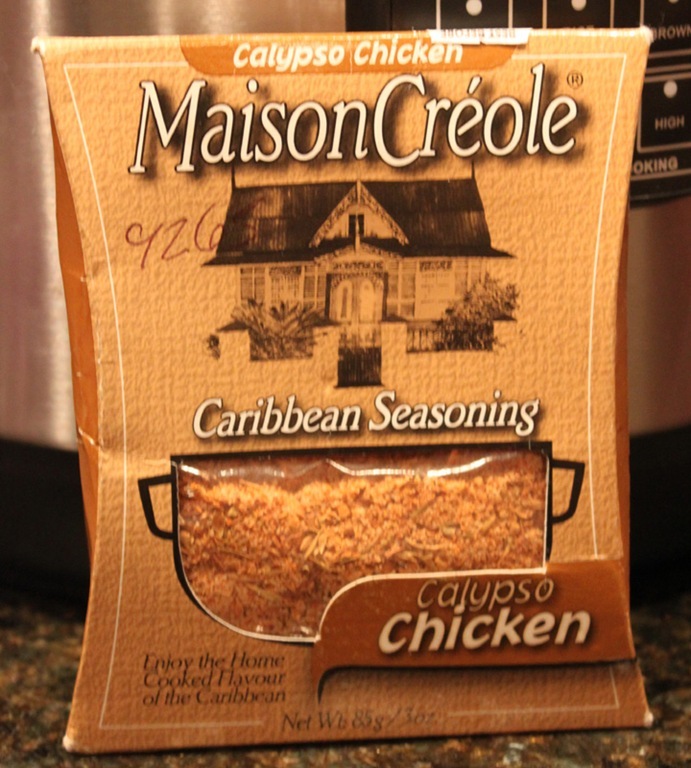 Some friends of ours got us this delicious caribbean seasoning on a vacation they took to the islands. You can use any cajun or creole seasoning though. Add that in along with the rest of the spices. 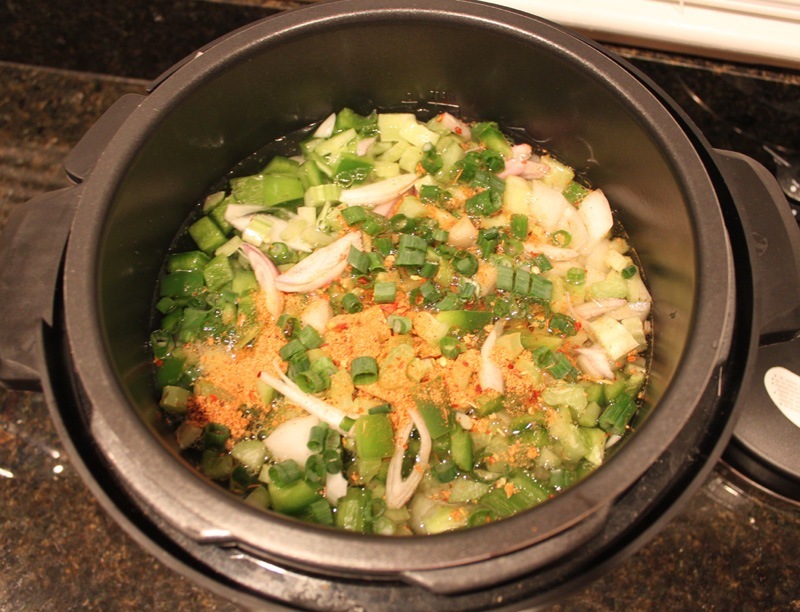 Add in the green onions, tomato sauce, and garlic, cover with water, and cook on low for 9-12 hours. The flavors have all broken down and blended together. 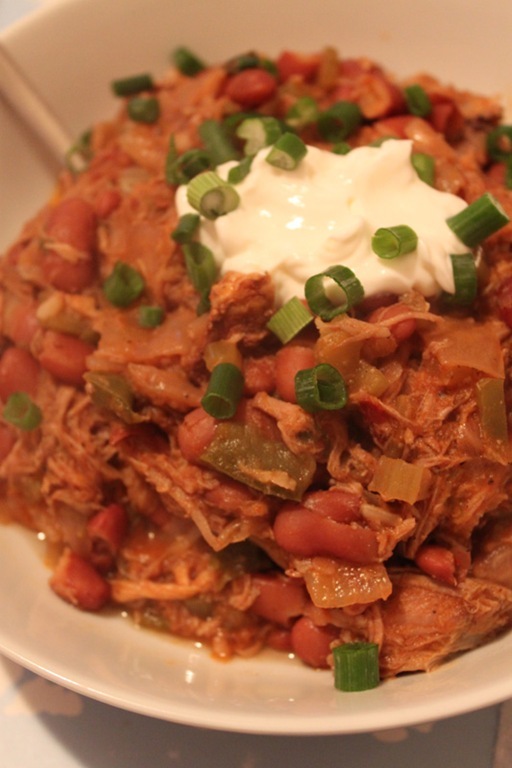 The beans take on an earthy quality and the pork renders down and takes on a rich flavor. The tomato and veggie broth brings it all together though. A whole bunch of yum. 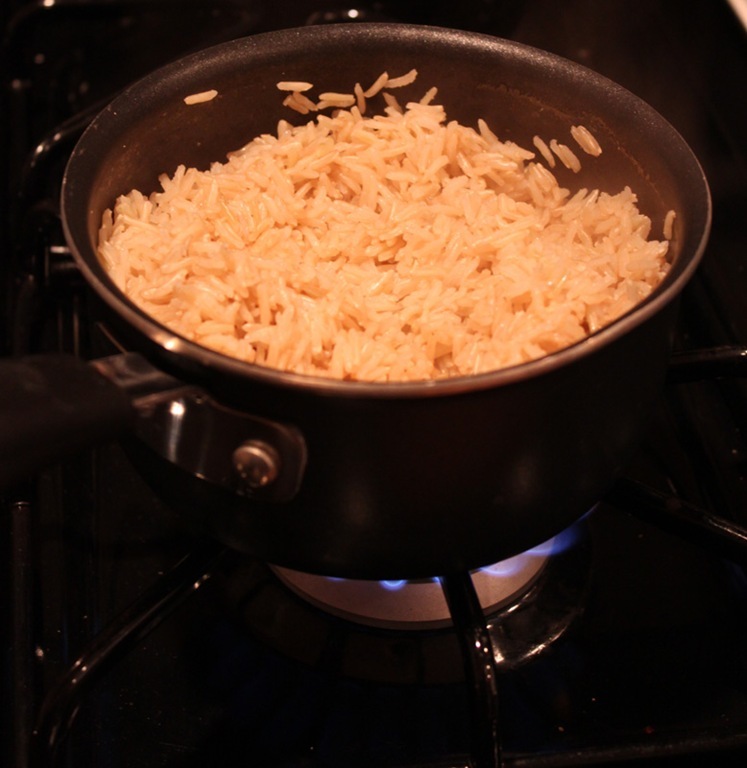 When you’re ready to serve the pork and beans, cook up some brown rice to serve it over. 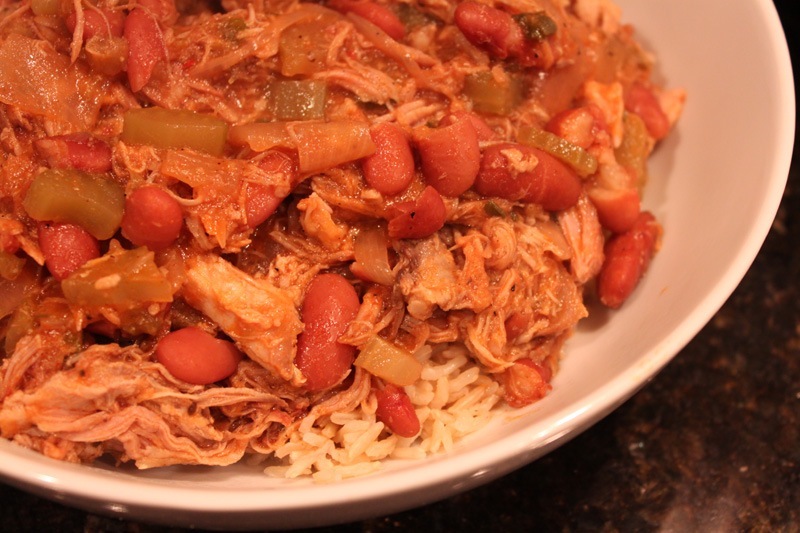 In a big bowl, make a bed of rice and pour the pork and beans over it. 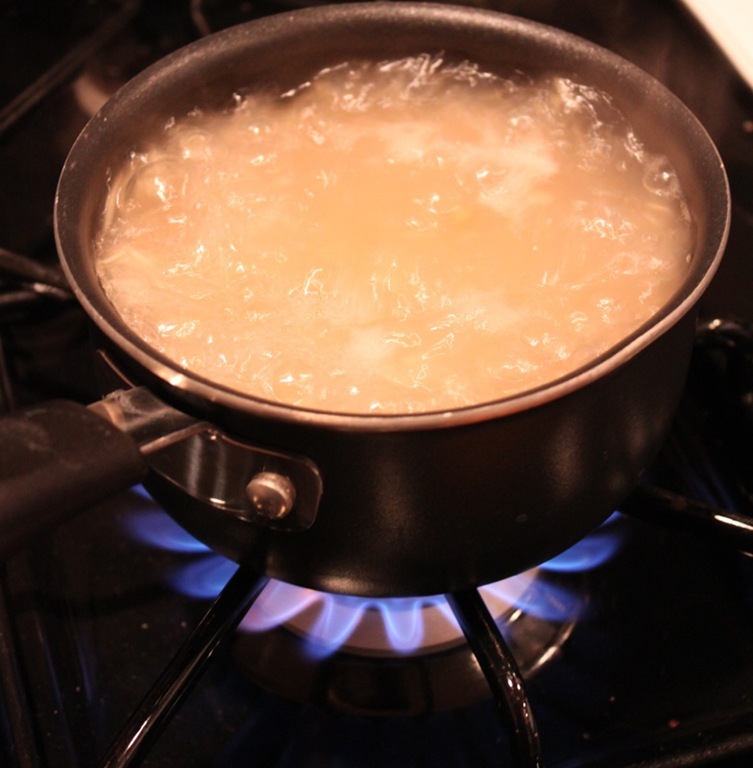 Make sure to get some leftover juices in the bottom of the bowl. 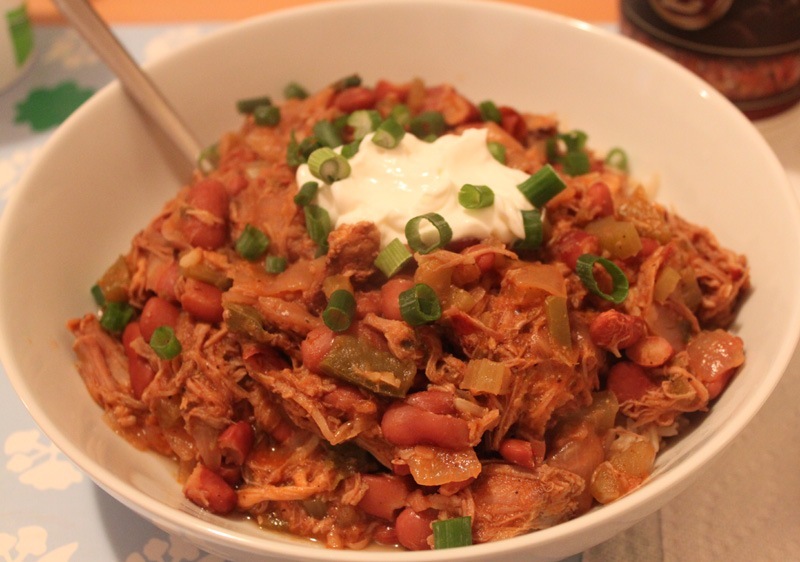 Top with a little bit of sour cream and green onions and enjoy! This whole meal is a great make ahead for work week dinners. 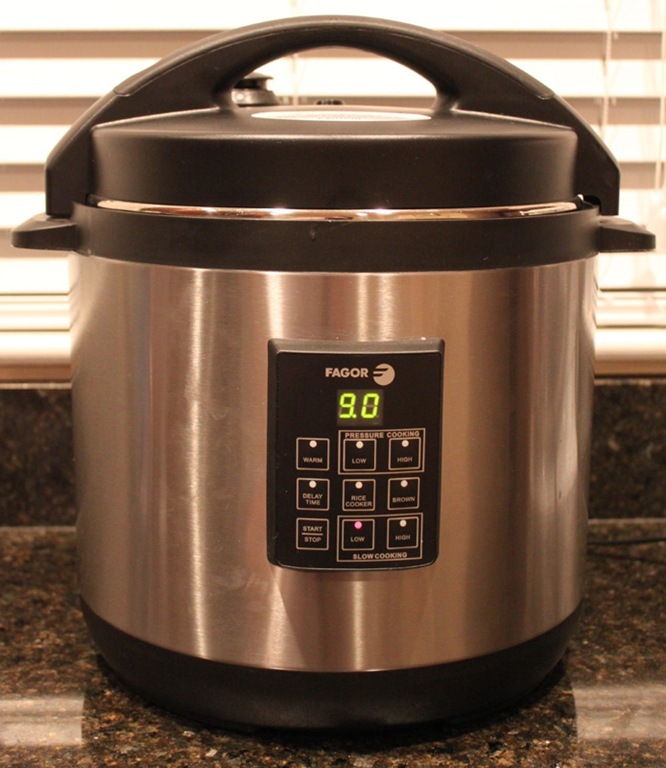 Just let your slow cooker go overnight or during the day and you have ready to go, delicious, and hearty suppers for the whole week. Easy as pie. Except it’s not pie, it’s pork and beans. yum! 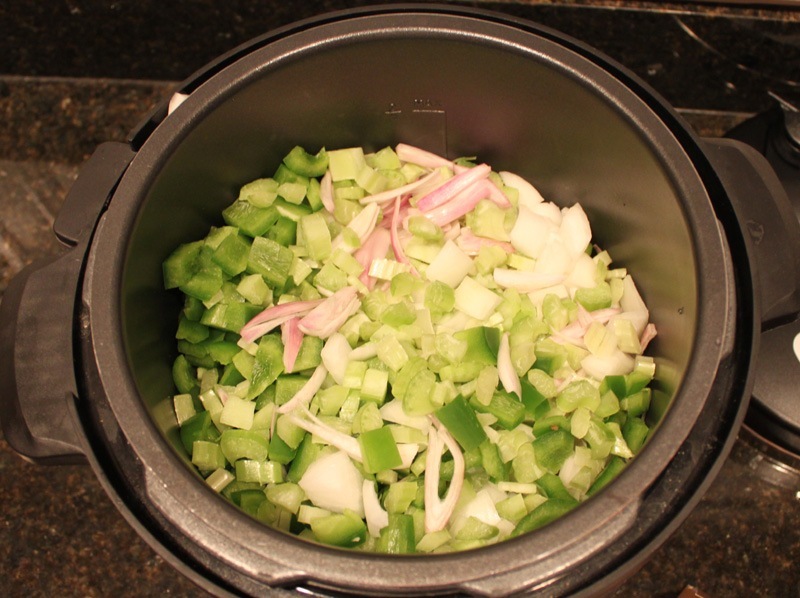 I’ve been looking for slow-cooker recipes a lot lately. Do you think you could use chicken instead of pork? Or too dry? With the added water, I think chicken would be fine!!! And yummy! Wow, amazing blog format! How lengthy have you ever been running a blog for? you made blogging glance easy. The full look of your site is excellent, let alone the content material! Thank you so much! I’ve been blogging for two years here on Domestocrat. I’m so happy you enjoy my entries!